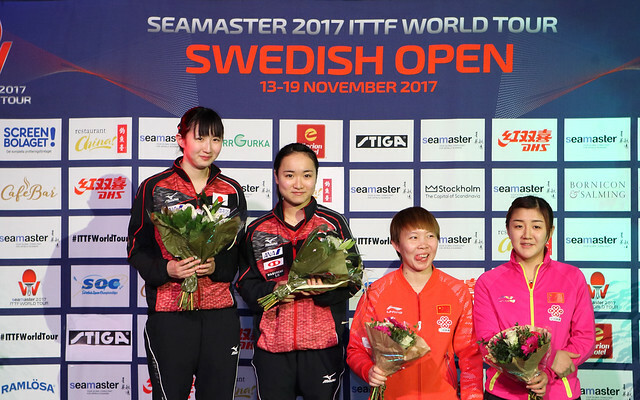 Inspired performances, on the morning of Tuesday 14th November in the Women’s Singles qualification tournament for the Seamaster 2017 ITTF World Tour Swedish Open, Marie Migot of France alongside China’s Sun Mingyang and Japan’s Mitsuho Kimura added to the success of the previous day. Not only did they add to their success, they secured first positions in their respective groups. All three first places were contrary to expectations; all three players started proceedings as the lowest rated in their respective groups. Presently listed at no.220 on the Women’s World Rankings, Sun Mingyang, having the previous day accounted for Laura Gasnier of France, named at no.138 (4-11, 11-8, 11-9, 11-5, 12-10) overcame Japan’s Saki Shibata, listed at no.38 (12-10, 11-8, 11-9, 11-7) to secure first place in her group. Comprehensive from Sun Mingyang, in the concluding contests for Marie Migot and Mitsuho Kimura, life was more exacting. Occupying the no.226 spot on the present day listings, Marie Migot accounted for Japan’s Maki Shiomi in six games, named at no.41 (11-4, 6-11, 11-4, 11-5, 7-11, 14-12), by a similar margin Mitsuho Kimura, who stands at no.297, overcame Canada’s Zhang Mo, ranked no.59 (14-12, 11-7, 11-9, 5-11, 6-11, 11-6). The previous day, Marie Migot had beaten Hong Kong’s Mak Tze Wing (8-11, 11-8, 11-9, 11-9, 11-9); Misuho Kimura had prevailed against Egypt’s Dina Meshref. Currently on the Women’s World Rankings, Mak Tze Wing is at no.133, Dina Meshref at no.103. First place in the group but it does not mean progress to the main draw, a preliminary round awaits. Surprise outcomes but not for the leading names as they started their quests for main draw places. Japan’s Miyu Kato beat Serbia’s Andrea Todorovic (11-7, 4-11, 12-10, 14-12, 8-11, 11-3), China’s Gu Yuting overcame Chinese Taipei’s Wang Yi-Ju (11-4, 14-12, 11-2, 13-11). Similarly, Singapore’s Zeng Jian beat Germany’s Wan Yuan (11-7, 11-7, 11-5, 11-3), Korea’s Seo Hyowon ended the hopes Audrey Zarif of France (11-6, 7-11, 11-4, 11-7, 11-8).